I had some downtime last Wednesday afternoon and decided to bake cookies for my evening yoga class. Well, and let’s be honest…for my own personal enjoyment too! I tend to always use the same cookie recipes and wanted to try something new with a fall twist. I found a recipe for pumpkin oatmeal cookies that sounded perfect. I decided to divide the batter in half and mix chocolate chips into one batch and white chocolate chips and dried cranberries into the other. The cookies were a huge hit with my yogis and I cannot even count how many I have eaten over the past few days. Addictive. The texture is definitely more on the soft side and the cookies have to bake a little longer than normal. 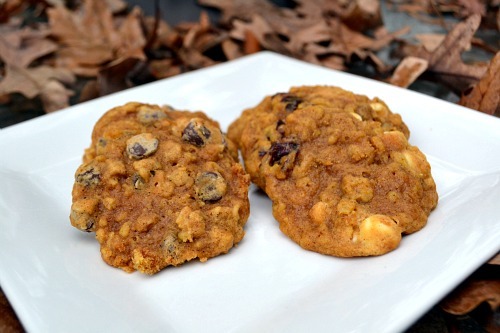 I am a fan of soft cookies anyway and I think the texture totally fits with the pumpkin flavor. 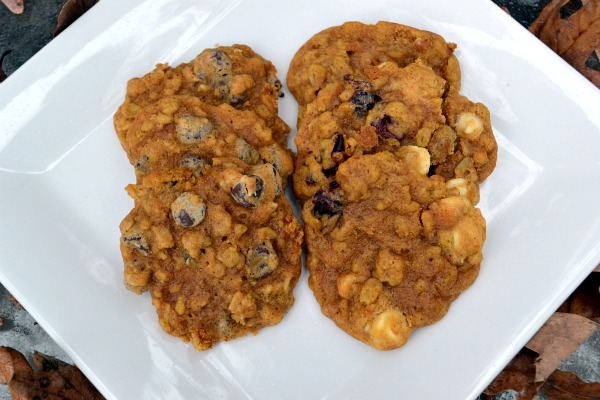 The cookie dough includes a heavy dose of pumpkin pie spice that really give these their fall flavor. These cookies will become a seasonal favorite in our house! In a medium bowl, whisk together flour, baking soda, cinnamon, pumpkin pie spice, and salt. In the bowl of a stand mixer, fitted with the paddle attachment (or in a large bowl with a handheld mixer), beat butter and sugar on medium-high speed until lightened in color and fluffy, 3 minutes. Add in eggs and vanilla and mix well. Add in pumpkin puree and mix until combined. Reduce mixer speed to low and add in dry ingredients. Finally, add in oats until just combined. Divide batter in two and add chocolate chips into one half and white chocolate and cranberries into the other. Using a spoon, drop about 2 tablespoon rounds onto prepared baking sheets, about 2-3 inches apart. Bake 12-14 minutes or until slightly browned. You may need to rotate the baking sheets halfway through depending on the temperature of your oven. Allow to cool before transferring to a wire rack.